Pottery have announced a UK tour. Following the release of their debut EP, 'No.1', on May 10, the Montreal quintet have lined up headline shows in Glasgow, Manchester and London in May, and Oxford, Southampton, Newcastle and Bedford in August. Prior to their spring dates they'll appear at the Great Escape in Brighton and Leeds' Gold Sounds Festival. 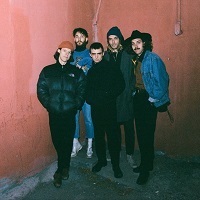 The band will also tour Europe in late May and North America with Fontaines D.C. in September, as well as having further festival sets inked in the diary, including Green Man and End Of The Road. Tickets are on sale now. "With 'The Craft' we wanted to explore the unconscious oddities of everyday life and how an outsider alien (Austin's [Boylan - singer and guitarist] character) may interpret these trivial actions. Each band member has a niche hobby (in the video) that not only lends for blind emulation from the outsider, but also represents each member's individuality within our collective project." Click here to compare & buy Pottery Tickets at Stereoboard.com.